Faq - Frequently Asked Questions. 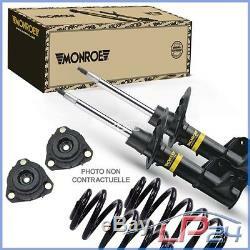 2x monroe shock absorber + suspension spring + shock absorber cups rear axle. You will find additional information in the vehicle model table! 2x monroe rear shock absorber 2x monroe rear suspension spring 2x monroe rear strut bearing. Before purchasing, please check the information shown in the vehicle model table! Fitting location: Rear axle Chassis type: for vehicles with standard chassis Chassis type: for vehicles without lowered chassis shock absorber type: gas pressure shock absorber model: spring-loaded shock absorber fastening type: pin top type attachment: bottom boss damper system: two-pipe system. Our promise of quality: 3 years warranty on function and accuracy of fit ... Quality product - new - fully assembled. 180 days guaranteed return free return. You will find our conditions of return in our information for the customers. In addition, you no longer have the effort to store, store and search your bill. Product Detail / Product Information. Monroe® offers a range of original products and high quality shock absorbers, which are manufactured in the same workshops and using the same technology as the equipment of your vehicle. Monroe® springs with lateral load compensation apply a radial force because of their special shape and ensure optimum control of the vehicle at all speeds. As a result, the spring deflection increases proportionally to the compression ratio of the spring. The installation of new monroe® mounting kits offers the following advantages. Better performance of the suspension and better handling. Vibration reduction, especially in the steering wheel, for better comfort. Please note the restrictions indicated in the table. Audi a4 front (8d5, b5). 11.94 - 09.01. Position: rear axle from the year of construction: 01/1999. 07.00 - 09.01. 02.96 - 09.01. 03.96 - 09.01. 12.97 - 09.01. Pitch: rear axle from the year of construction: 01/1999 to construction year: 06/2000. 03.00 - 09.01. 03.97 - 09.01. 08.97 - 09.01. 09.97 - 09.01. 10.96 - 09.01. Corresponds to the following oe numbers. 5l liters 0w-40 a3 / b4 castrol edge fst engine oil bmw longlife-01 ### reinforced by titanium fst ###. 5l liters 5w-40 c3 castrol magnatec motor oil acea c3 ## branded product distributor pro auto parts ##. 5 liters castrol titanium fst 5w-30 ll engine oil acea c3 # product brand distributor pro auto parts #. 5 liter castrol titanium fst 5w-30 c3 engine oil bmw longlife-04 # quality mark of the German castrol dispenser #. 5 ltr 1 liter castrol magnatec stop-start 5w-30 a5 engine oil acea a1 / b1 ## also protects engines without a start-stop system ##. 180 days guaranteed return period. Return shipping costs are the responsibility of the seller. You will find our conditions of return in our information intended for the customers. Our service - your advantage! All items are subject to quality control. Almost all of our suppliers are DIN certified in ISO 9001: 2000. You will find a complete assortment in our boutique lapièce24 by clicking here. Note that a delay in delivery may occur due to customs clearance. 3418235012 - 3418228012 - 3418163012. Wide range of products for all car brands. Always more than 800,000 pieces in stock. Original new parts from all renowned manufacturers at the lowest prices. Express shipping within 1-2 business days. Secure and flexible payment possibilities. You will find it in the big universe of .. the item "monroe kit set gas shock absorbers + springs + cups rear axle 3209919" is on sale since Thursday, September 14, 2017. It is in the category "auto, motorcycle parts, accessories \ auto \ spare parts \ suspension, steering \ shock absorbers ".